If you were asked to name the holy trinity of tequila drinking, the obvious answer would be salt, tequila, and lime. It’s the de facto way to order a tequila shot in places around the US. But if you want to drink tequila and actually enjoy it, then you should avoid washing it down with a mouth full of lime. Instead, you should chase tequila the traditional way with sangrita. Sangrita, meaning “little blood” in Spanish, is a traditional spicy juice mixture that’s sipped alongside a shot of tequila. It’s not to be confused with sangria, the fruit, wine, and brandy drink popular the world over. Sangrita is sipped for the purpose of enhancing the spirit’s earth-driven nuances. That’s right, this isn’t your traditional chaser, and it certainly isn’t used to drown out the sorrows of bottom-shelf swill. This non-alcoholic spiced beverage, meant to be sipped instead of taken as a shot, is actually a beverage enhancer, meant to magnify, not mask, the flavors within the spirit. Think of it as a friend that brings out tequila’s best side while also cleaning your palate. The history of sangrita is hazy, but OG sangrita recipes hail from the Lake Chapala region of Jalisco, Mexico. It’s usually crafted from leftover orange juice, pomegranate juice, powdered chiles, and other spices. Although many American recipes include a heavy dose of tomato juice, the more authentic recipes tend to be citrus heavy and dominated by orange juice, lime juice, chili powder, and other various spices. That said, sangrita can essentially be whatever a person wants it to be as long as it’s acidic and spicy. It’s kind of like a bloody mary recipe: Once you nail the basics down, you can adjust the drink to whatever your taste buds crave. No matter how you do it, it’s infinitely better than licking salt off the back of your hand and biting a lime every time you want to drink tequila. So next time you’re looking to add some spice to your drinking life, look no further than a healthy dose of sangrita. Take this recipe as a general guideline, and adjust (and expand) as you see fit. The best sangrita is the one you make yourself. And always remember: Sangrita was designed as a way to use leftover juices. House-made sangrita is common at quality tequila bars around Mexico, but it’s a little harder to find the farther north you go. Here are a few places to try it yourself if you have a chance. Big Star in Chicago: This one’s for the people who want to drink sangrita but prefer their shots served with a beer as well. 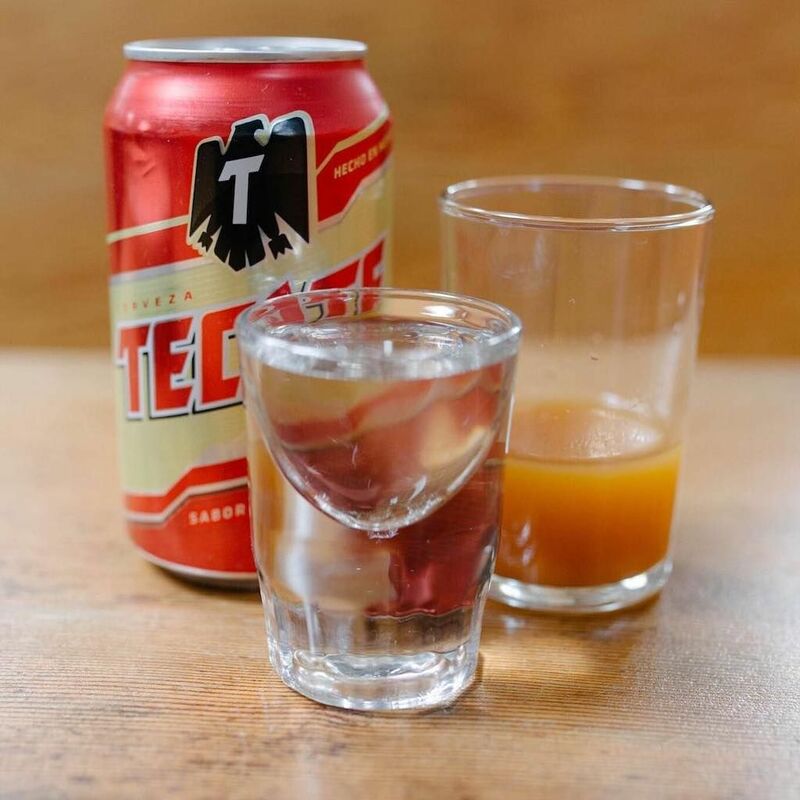 Dubbed Los Tres Reyes, Big Star serves a drink that consists of a can of Tecate, a shot of tequila, and a shot of sangrita made with pineapple, apple cider vinegar, habanero peppers, and orange. La Biblioteca in New York City: It’s only fitting that the bar with one of the largest collections of agave spirits in the Big Apple also serves house-made sangrita. The bar’s name translates to “the library,” and it features some 400 bottles of tequila, mezcal, and sotol. You can even store your own bottles here, and, if you’d like, have the bartender pour some sangrita alongside. Sangrita Saloon in Indianapolis: You have to respect a bar that’s true to its name. Sangrita Saloon is an agave-focused restaurant and bar with more than 120 different agave spirits. It also, of course, serves house-made sangrita with the tequila (which you can get with a side of Tecate as well if you’d like).